← Week 5 – Englishman goes Viral, Unbelievable!!!!!!!!!!!!!!!!! Shopping seems to have become our most popular pastime since arriving in Latvia. Late yesterday Inta invited one of her cousins for lunch today (Sunday). The fact that we had no food in the fridge coupled with the fact that we only got home about 10.00 last night dictated we embark on an early morning shopping expedition. Amazingly the local farmers market at Kauguri, which we shop at regularly, is open on a Sunday. In fact it is open every day. Lazy is one thing Latvian farmers are not. I suspect the need to sell your produce 7 days per week is drawn out of necessity not desire. As much as I enjoy shopping at local food markets, a Sunday morning lie in bed had much more appeal, but I didn’t really have a choice as Inta doesn’t drive and the basket on her bicycle isn’t big enough. When in the UK Inta would complain about how long it would take to get our weekly shopping done and it was usually my fault. The shoe is on the other foot now. 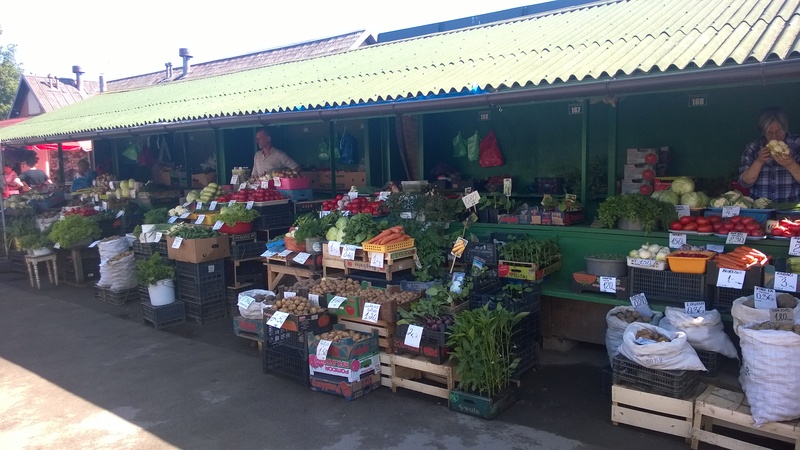 We arrived at the market with a fairly short shopping list consisting of mainly salads and strawberries; Latvian varieties are just becoming available and they are delicious. Easy you might think; oh no!! Since arriving back in Latvia Inta has been struck by a mysterious illness; indecisiveness it’s called. Now virtually every stall sells salad stuff, so this should be easy. Oh no, because every stall sells salad stuff we have to visit every stall at least 3 times. Inta says she is trying to find sellers who give out positive energies, sellers who she feels she can trust. What’s trust got to do with it, I just want a bowl of salad. Examining radishes to make sure they aren’t too big, checking the ends of cucumbers for any sign of yellowness and inspecting tomatoes for any sign of bruising. I really feel for the stall holders as Inta approaches them time and time again. It’s a bit like a Chinese water torture. Each time we approach I see the expectation of a sale in their eyes, only to be disappointed when Inta finds a blemish of some type. Eventually we complete our shopping and to give credit where credit is due, Inta chose some lovely salads and vegetables. We had a lovely lunch with her cousins, I spent another four hours not understanding a word that was said apart from the occasional alus (beer), burkans (carrots), kartupelis (potatoes) and loti garšigs (very tasty). Really got to get going on learning Latvian. We had another lovely day yesterday. We spent 5 hours walking around the annual two day market at Etnografiskais Brivdabas Muzejs (an open air ethnography museum). This takes place in a forest just outside Riga and judging from the number of cars trying to park, I think the whole of Riga was there. Although absolutely huge, spreading over many hectares, it had a charming atmosphere. It is really a celebration of all the traditional Latvian crafts and most stall holders were dressed in traditional costumes. Befitting a Latvian gathering there was copious amounts of food and alcohol including traditional foods such as braised pigs snouts. Although tempted, I decided against the snout as I had no idea about how to start eating one. I’ll have to watch somebody and have a go next time. Leaving mid afternoon with my wallet much lighter I was left wondering how many oak spoons and wicker baskets the average Latvian family owns. You could probably have filled two football pitches with the number of wicker baskets of all shapes, colours and sizes that were on sale and there were thousands of wooden kitchen utensils. Wicker baskets leave me a bit cold but the oak utensils were beautiful so out came the wallet. Spent the rest of the day at a coastal town called Saulkrasti which is about 45 km north of Riga, visiting a colleague rom school and eating strawberries just picked from his garden. Yummy or loti garšigs I should say. All the prices are virtually the same! !